From French Merlot and Cabernet Sauvignon varieties cultivated in vineyards in Nea Mesimvria, Thessaloniki. Classical red vinification with long extraction and controlled fermentation. Aging and maturation for 18 months in French oak barrels.. 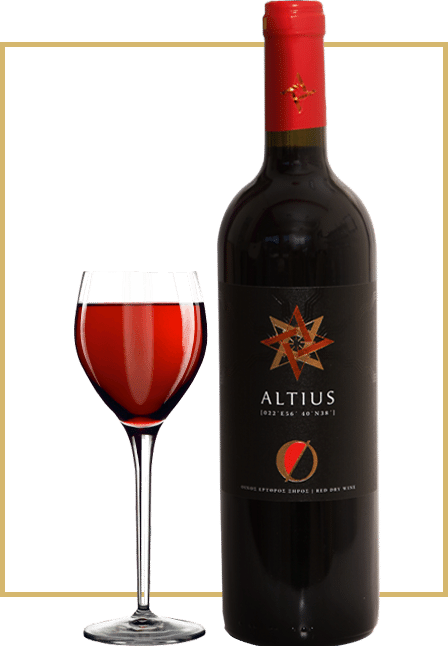 Deep red ruby color, red fruit aromas and spices with ripe velvety tannins, balanced acidity and a long smooth finish. Served at 160 - 180 C in a large tulip shape glass. Accompanied with grilled red meat and aged rich yellow cheese. It can be further aged. Silver medal at the Concour Mondial de Bruxelles International Contest in 2017. Silver medal at the Decanter World Awards in the International Wine Contest in 2011. 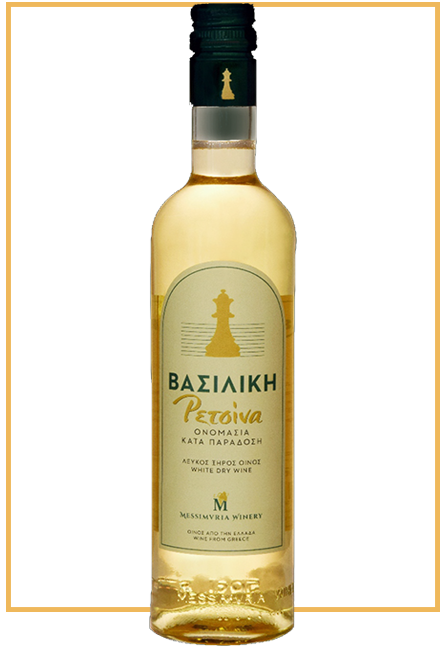 From the Greek variety “Malagousia”*grown in vineyards in Nea Mesimvria, Thessaloniki. Pre-fermentation extraction, controlled fermentation by standing lees for several months, gaining in structure and body. Malagousia: An ancient Greek variety that threatened to disappear. It has intense and complex aromatic character with a rich flavor. The fragrance distinguished from the nose contains flowering perfumes (rose, jasmine, orange and lemon blossom) and fruity notes (peach, pear, melon, lime, grapefruit,). It can give great wines of alcoholic strength, moderate acidity, with a pleasant fruity aftertaste. Bright lemongreen color with yellow highlights. Intense bouquet of ripe fruit flavors. It has a delicate mouth with refreshing acidity and balanced finish. Served at 8 -10 ° C in a small tulip shaped glass for young, white wines. Ideally accompanies salads, appetizers and first courses of meals such as pies, dumplings, cheese pancakes, chicken and pork with white sauces, Asian dishes with sour sauces. It is ideal as aperitif. Silver medal at the Decanter World Awards for the International Wine Competition in 2011. Gold medal at the International Wine Competition in Brussels in 2009. 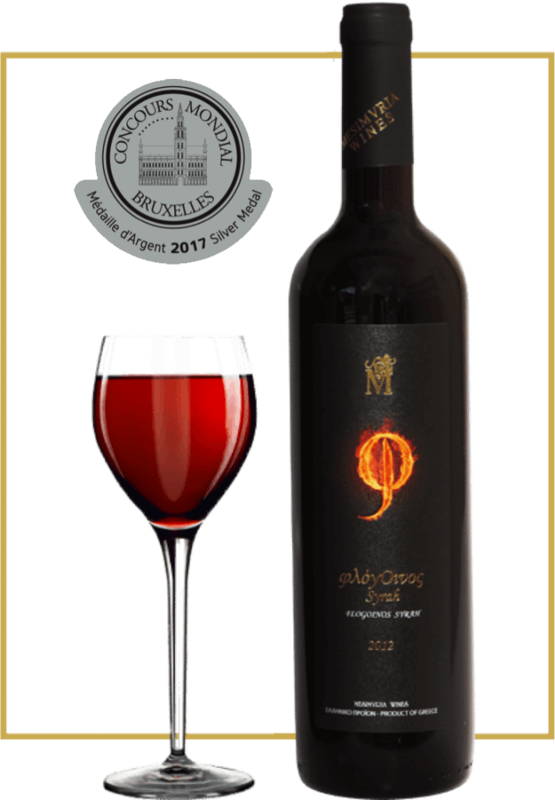 Silver medal at the Organic Agriculture Wine Competition organized by DIO in Athens in 2008. Silver medal at the Thessaloniki International Wine Competition in 2007. 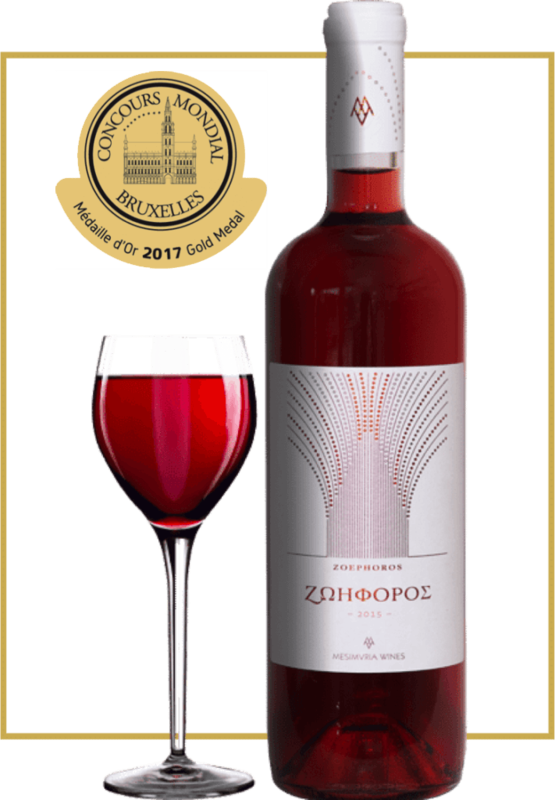 Silver medal at the Thessaloniki International Wine Competition in 2019. Aging and maturation for 12 months in French oak barrels. magenta color, perfumes of red forest fruits, nuts and spices, ripped silky tannins, balanced acidity and long complex aftertaste. Served at 160 - 180 ° C in a large tulip shaped glass. It accompanies red meats in complex sauces, rich sauces and aged yellow cheese. Silver medal at Concor Mondial de Bruxelles International Contemporary Competition 2017. Silver medal at the International Wine Competition in Brussels in 2009. 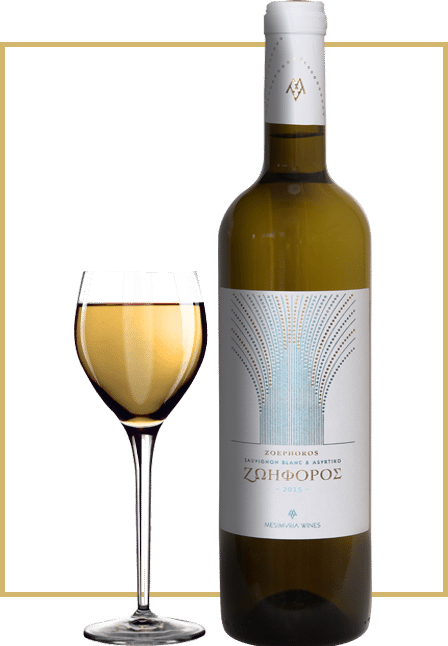 Silver medal at the Thessaloniki International Wine Competition in 2015. From French Syrah varieties cultivated in vineyards in Nea Mesimvria, Thessaloniki. Classical rosé wine with pre-fermentation extraction, bleeding and controlled fermentation. Rose color, intense fruity aromas of strawberry and blueberry, balanced acidity and fresh fruity aftertaste. Served at 100 - 120 ° C in small tulip shaped glass for aromatic rosé wines. It accompanies pasta and tender white meat with red sauce, chocolate desserts and red fruit. Gold medal at Concours Mondial de Bruxelles International Contest 2017. From Greek Asyrtiko and French Sauvignon Blanc varieties cultivated in vineyards in Nea Mesimvria, Thessaloniki.. Features: Bright lemongreen color with yellow highlights. Intense bouquet of ripe fruit flavors. It has a delicate mouth with refreshing acidity and balanced finish. Served at 8 -10 ° C in a small tulip shaped glass for young, white wines. Ideally accompanies salads, appetizers and first courses of meals such as white meat and grilled fish. From Greek Roditis varieties cultivated in vineyards in Nea Mesimvria, Thessaloniki. Controlled fermentation with simultaneous extraction of resin. Intense golden-yellow color with aromas of flowers and fruit. It has full and mellow taste with a pleasant acidity and a wonderful finish. 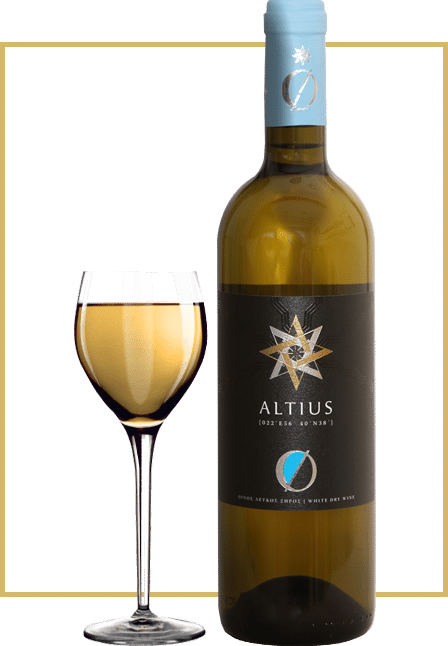 Ideally served at 8 - 10 ° C in small tulip shaped glass for young white wines. Ideally accompanies Mediterranean dishes, seafood, fish, white meat, poultry and salad with feta and tomato. From Greek Roditis and French Sauvignon Blanc varieties cultivated in vineyards in Nea Mesimvria, Thessaloniki. Intense golden-yellow color with aromas of flowers and fruits. It has a full flavor, with pleasant acidity and elegant finish. Served chilled at 8 - 10 ° C in small tulip shaped glass for young white wines. It accompanies Mediterranean dishes, seafood, fish, white meat and poultry. 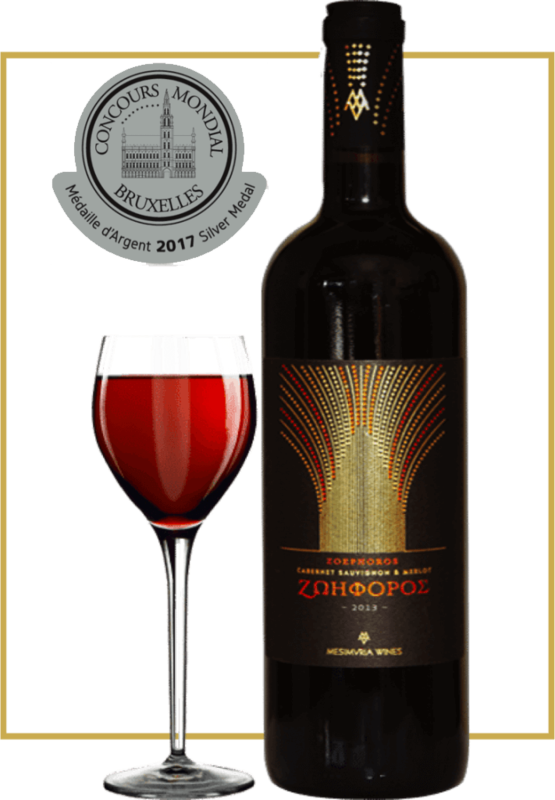 From French Merlot and Syrah varieties cultivated in vineyards in Nea Mesimvria, Thessaloniki..
Classic red vinification with controlled fermentation. 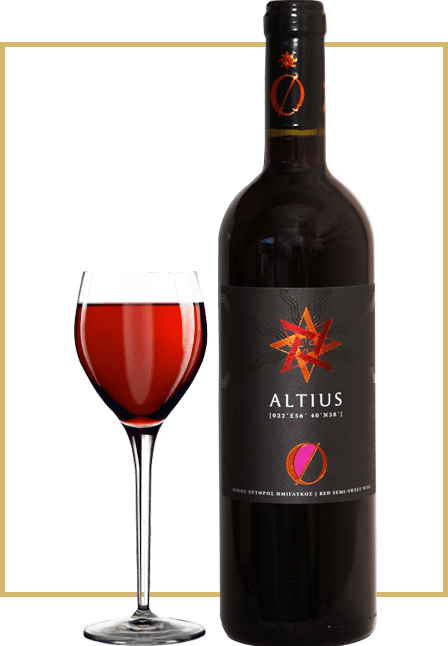 Bright red color, aromas of red forest fruits, nuts and spices with ripe soft tannins, balanced acidity and a long fruity aftertaste. Served at 120 - 140 ° C in a tulip-shaped glass and accompanies tender red meats . From French Merlot varieties cultivated in vineyards in Nea Mesimvria, Thessaloniki. Bleeding after extraction 36 hours red grape. In the remaining must becomes classic red vinification with controlled fermentation. Before bottling the must and the red wine are joined. Bright red color, fruity aromas of peach, banana and pineapple. It has soft tannins, balanced acidity and a long fruity aftertaste. Enjoy fresh at 120 - 140 ° C in a tulip-shaped glass. It accompanies tender red meats.